Where has the year gone?! I seriously don't know...but 2014 is upon us. Coming up on Christmas Eve on the Vegas Morning Blend...a quick and easy, no bake dessert you can take to your friends house. S'mores Cheesecake!! 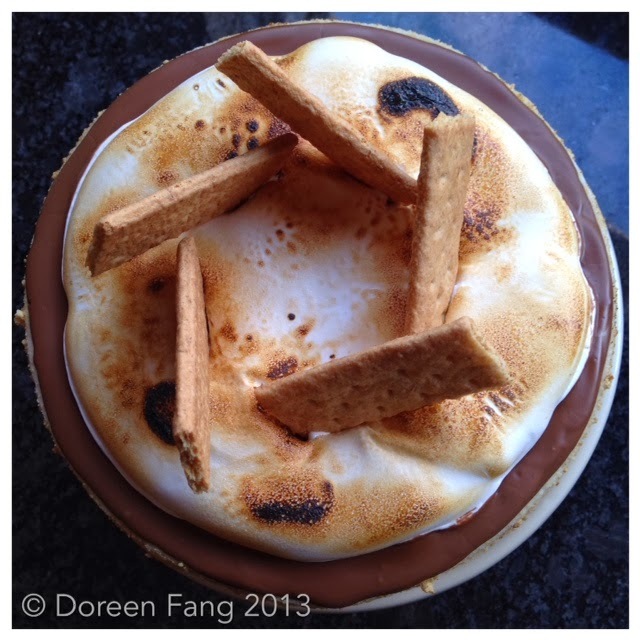 Who doesn't love chocolate, marshallows and graham cracker with the added decadence of cheesecake? If you purchased a frozen cheesecake, follow the instructions to thaw the cheesecake. Add additional graham cracker crumbs to the edge of the cake by grabbing a handful of the crumbs and pressing it to the sides of the cake. Continue to turn the cake and add additional crumbs until the whole cheesecake is crumbed and there are no empty spots on the sides of the cheesecake. After you have melted the chocolate (either in a double boiler or microwave, depending on the instructions on the package), allow the chocolate to cool slightly, approximately 5 minutes or just warm to the touch. Pour approximately 11⁄2 cups of melted chocolate on to the top of the cheesecake; using an offset spatula, spread the chocolate to the edge of the cheesecake. Add the remaining chocolate if needed or desired. Refrigerate the cake for about 10 minutes to allow the chocolate to set. Add additional time if the chocolate is still wet to the touch. Remove the cake from the refrigerator once the chocolate has set. Add the marshmallow cream onto the center of the cheesecake; spread it out slightly leaving about 11⁄2” from the edges so you can still see the chocolate. Torch the marshmallow crème and until slightly browned and garnish with the graham crackers. Cut and serve! This is a quick and easy dessert to take to a party especially if you don’t have the time to bake! Wishing you and your loved ones a beautiful holiday filled with lots of great food, laughter and love! This is a wonderful recipe. Looks cool! I think I would like it. I’ll cook it right after your dish with mushrooms and cheese.